There are 12 miles of trails. Teacup Lake, a mere 1 hour and 20 minute drive from downtown Portland, has excellent groomed trails for cross-country skiers, but is not your ordinary series of trails. It is run by the Teacup Nordic Club and, through that membership, skiers are offered the opportunity to be a part of a skiing community. The community feel at Teacup Lake has greatly contributed to the trail conditions, amenities, and atmosphere. They offer a membership program that affords you unlimited skiing on the groomed trails, grooming reports via email, 10 percent discounts at selected ski retailers, and voting rights in the Teacup chapter. Being a part of the membership program also provides a sense of community to skiers and can lead to finding friends and mentors among fellow skiers. The way that Teacup operates is unique because it is run by the Teacup Lake chapter of the Oregon Nordic Club. They rely on volunteers for their operation as well as various donations and membership fees. All events at Teacup and maintenance work are organized by volunteers. There are 12 miles of groomed trails that range in difficulty and accommodate both skating and touring skis. The trails at Teacup are wide enough for two tracks as well as skating in the center. The man that grooms the trail is a member and skier himself, which adds to the community atmosphere of Teacup. The most popular loop is called the Outer Loop which includes going up Teacup Road, to Lakeside, taking a right on Nordic Way, left on Hood River Road, right on Larch and finally a left on Meadow trail, which leads back to the cabin. 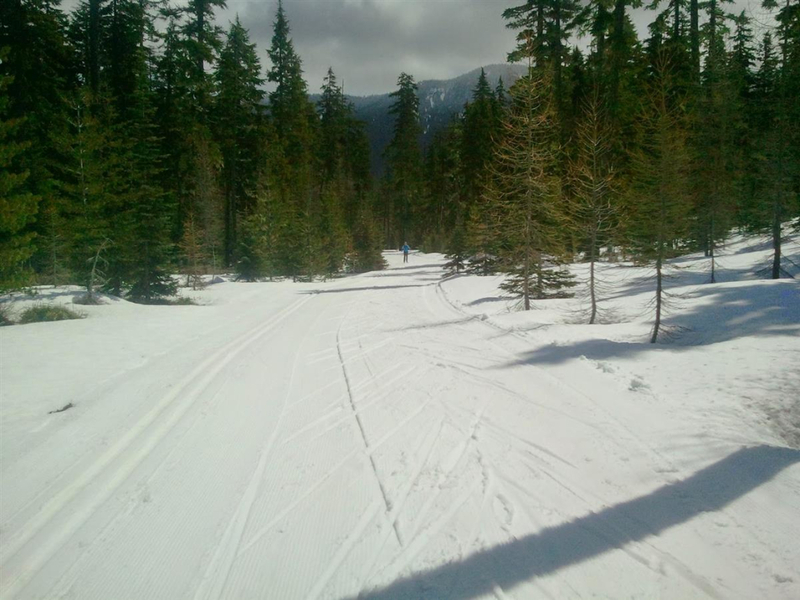 There is something to enjoy for cross country skiers of all skill levels at Teacup Lake. It is very easy to make adaptations to the most common loops to make them accommodating to beginners. The people who operate Teacup also offer ski lessons through the Gorge Super Club, including a skill and fitness series that will be in session all season long. There will be 4 classic classes and 4 skate classes every week for 12 weeks starting December 15th. The classes meet on Tuesday, Thursday, Saturday, and Sunday and claim to turn a beginner into a strong intermediate skier in just one season. More experienced skiers can enjoy the trails on the outer part of the trail system. There are also trails that have steeper hills for intermediate or experienced skiers who desire a challenge. These include Vista Ridge, Tom’s Revenge, Raven’s Way, and Mountain View. The trail grooming starts as early as possible, even early November, when there is about 5 or 6 inches of snow. Teacup opens once the trails are able to be groomed and does not close until the end of April, weather permitting. The trails continue to be groomed 4 times per week. It is suggested that skiers who decide to enjoy Teacup become members or make the suggested $10 donation. Simply park at the Teacup Lake Sno-Park, which is easy to access and is right off of highway 35, about 36.5 miles south of Hood River. A Sno-Park permit is required.